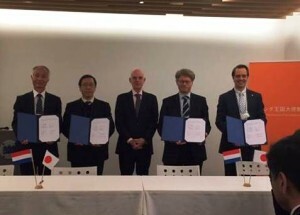 On February 8, TU Delft signed an agreement with Japan to formalize its collaboration on Ocean Thermal Energy Conversion (OTEC) and other ocean energy solutions, including tidal, wave and current energy. The signing ceremony was part of a seminar on ocean energy at the Embassy of the Kingdom of the Netherlands in Tokyo. The seminar, during which Ambassador Aart Jacobi gave a complementary speech and witnessed the signing ceremony, gathered about fifty researchers and industry experts and helped to establish many new contacts. The Netherlands and Japan are front runners in the field of ocean energy. Both countries have a renowned maritime industry and show a long-term dedication towards ocean energy research and development. During the seminar Henk Polinder from the Ocean Energy Platform of Delft University of Technology, Joost Kirkenier from Bluerise, Dr. Yasuyuki Ikegami from Saga University and Mr. Takayuki Watanabe from Xenesys gave a summary of their respective academic and commercial activities in the field. They underlined the importance of international industry-academia collaboration and government policies in ocean energy. After their presentations, a collaboration agreement was signed to formalize the mutual cooperation between the four parties. One of the first activities under the agreement is the participation of two TU Delft researchers in the 3rd International Program on Ocean Energy for young researchers in Japan. 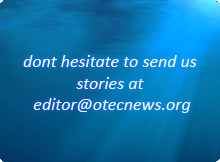 Another collaborative activity is the development of novel heat exchangers for large scale OTEC plants. There is much to gain using the latest advancements in materials, manufacturing techniques and computational capacity. Part of the trip to Japan was a visit to the 100 kW OTEC demonstration plant at Kumejima Island. This OTEC plant has been successfully in operation since 2013 and is built within a 10 ha industrial park that clusters different technologies around the use of cold, deep seawater, such as aquaculture, seawater cooled greenhouses and fresh water production. Together, the deep water-based industries at Kumejima generate an annual turnover of 20 million USD, which is 25% of the islands Gross National Product. This industry park is an inspiring example of the potential of ocean energy to enhance sustainability and economic growth in tropical regions. The visit and collaboration was established with the help of the Innovation Attaché at the Dutch Embassy in Tokyo.